I am so excited to have one of the BEST substitute teachers out there guest blogging today! She has wonderful ideas and truly brings an outstanding educational experience to all of the students in her care. Rachel from Sub Hub is someone who I have enjoyed collaborating with over the last year or so! Don't forget to get more tips and news about freebies over at her blog! Just follow her to recieve the latest updates. If you get a chance, please comment and let her know how you like her freebies! Hello, everyone! And a huge thank you to Leanne for hosting such a wonderful event as Stuff Your Files. I saw one of those funny eCards on Pinterest the other day that said something like, "I hate getting free teaching materials... said no teacher ever." Ha! And how true is that! Don't we all love free stuff? I am Rachel from Sub Hub. My blog is focused on improving the profession of substitute teaching as well as helping teachers learn ways to make the most of those days when they have to be out of the classroom. Too many classroom days across the world are spent with substitutes, for those days to just be written off as "busy work" days, "babysitting" days, or "fend for yourself" days. I offer tips, tricks, and techniques to teachers and subs to be the best they can be with the end goal of benefitting students in the best way possible. What I have free for you today is free always and forever... emergency sub plans. It's quite OK to admit that there are those days when you have to be out and for one reason or another, you just can't get around to writing plans. 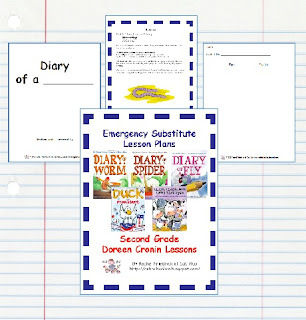 I have a set of free K-5 emergency sub plans. Each set of plans is one-day's worth of grade-specific lessons focused around a theme or book. Included in each set is a materials list, printables, and instructions for a warm-up activity, a reading lesson, a language arts lesson, a math lesson, a science lesson, and a social studies lesson. Use as much or as little as you need. You can find each grade level of plans in my Teachers Pay Teachers store. The images here are from the first and second grade plans, but like I said, K-5 sets are available. I hope you find something you can stuff your files with for this new school year! Again, thank you to Leanne for being such a gracious hostess, and stop by and visit Sub Hub sometime! Those sub plans are awesome! Great work!